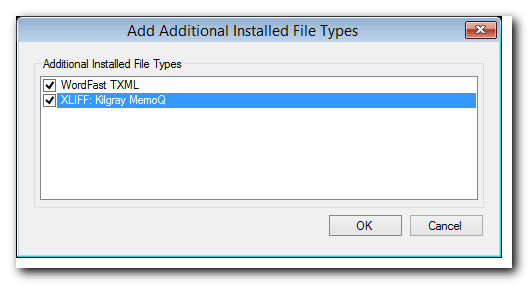 Although installed, the WordFast TXML and MemoQ MQXLIFF file types are not displayed in Studio’s File types list. The Message Additional File Types Installed indicates that there are additional file types installed that are not showing on the list. Now, all the additional file types should be displayed in the File Types List. 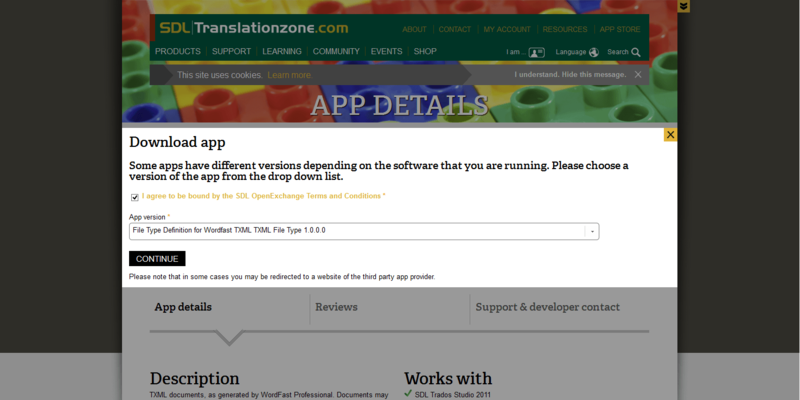 In this WordFast case study the text for translation was provided as a WordFast Professional TXML file, and after installing the TXML file definition Studio was able to read and write it without any issue. Note that Studio still converts the TXML into a SDLXLIFF file, so when the work is done make sure to save the file back in its original format by using the Save As Target… (Ctrl+F12) command or finalizing the project through the Batch Tasks menu. Modern TEnTs support the Translation Memory eXchange (TMX) format for storing and exchanging Translation Memory information. The TMX doesn’t support all the extended metadata that some proprietary TM file formats support, so when exporting a TM as TMX some metadata, such as custom fields and attributes, might be lost. However, TMX files generally make sharing and migrating Translation Memory information easier, especially if the TM doesn’t support proprietary metadata fields. Personally, I try to maintain my TMs free of any critical proprietary metadata. I know that some use the Client and Project fields to create some internal structure and separation within a large TM, but I always found it a bit restricting both in terms of my workflow as well as in terms of “future-proofing” the content; even more so nowadays that all modern TEnTs allow to use more than one TM (the historic limitation of SDL Trados 2007 or earlier) so the user can add as many many TMs as needed as reference. Another recommendation is to create an Exclusion file (in Studio, in other tools this information might be available in another form) when importing a TMX file. The exclusion file stores all the TM segments that failed to import for one reason or another, and makes it easier to get a quick overview of what was left out, to identify possible problem patterns, and determine if the failed segments are even worth stressing over. Although they will naturally become less prevalent with time, it is still important to understand how to handle legacy TM formats. New generations of TEnTs can import information that was created their previous generation of technology; Studio for example can “upgrade” – i.e. convert – legacy SDL Trados TMs (in the TXT and MDW file formats) to its new SDLTM file format, but it cannot read TMs that were created by other TEnTs, unless they are in the TMX file format. Because past generations didn’t usually care much for open standards and interoperability, dealing with legacy formats could be a problem. In this WordFast case study the TM was provided in the legacy TXT format of WordFast Classic. Although both WordFast Classic and SDL Trados 2007 or earlier can store the TM content in a plain text file, the data is structured differently and therefore Studio and WordFast Classic cannot read the legacy TMs of each other. 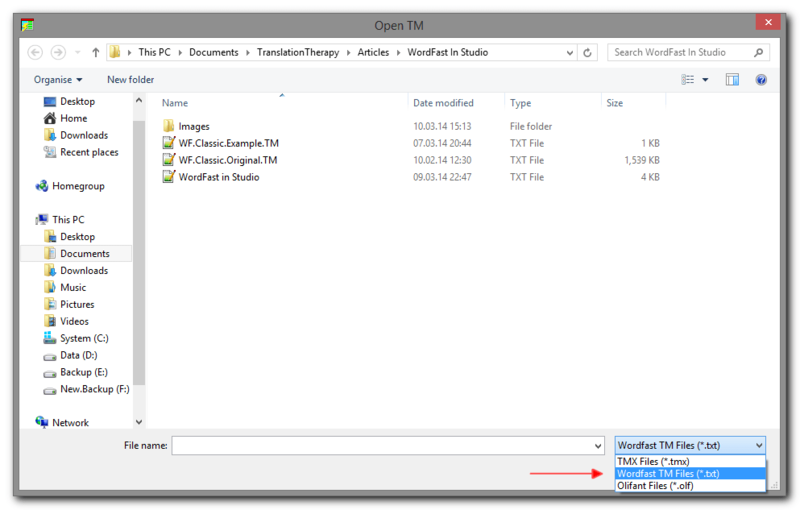 Once the TM is opened in Olifant, quickly go through it to make sure that there are no major obvious character encoding issues (a potential problem when dealing with plain text files, especially for non-Latin languages), and then use the File > Export command to save the content in a TMX file. The WordFast legacy .txt TM opened in Olifant. For demonstration purposes the source and target segments are the same. In this WordFast case study only one out of approximately 3,000 segments filed to imported. When consulting the Exclusion file I’ve immediately noticed that this segment contained Gibberish character in the target segment, probably due to some encoding mishap somewhere along the life cycle of the original TM, and it was certainly not something worth stressing over trying to fix. Now, with the new file definition installed and the legacy WordFast Classic TM safely imported into Studio, what seemed at first as a discouraging project that will take some doing and “Tools-hopping”, turned out to be quite simple to setup and complete in full within Studio’s Editor Environment, which in this case was the TEnT of choice. Sharing or migrating Terminology could be a bit more complicated because the terminology management modules of the various TEnTs not all support a standardized file format for exchanging terminology with all of its metadata (custom fields and structure). In terminology work, especially with more complex structured glossaries/term-bases, the medtadata could be a critical component, so the lack of of full metadata support require some more careful attention and planning before exporting and importing that information. With this limitation in mind, the safest and probably easiest way to share and migrate terminology information is via a delimited file type such as a Comma-Separated Values (CSV) file. For exchanging simple structured glossaries (i.e. a source term field and a target term field) sharing the information via a delimited file works perfectly. In this WordFast case study there was no extenal glossary provided, but I used this opportunity to convert my colleague’s own glossary stored in a two-column Excel spreadsheet to a MultiTerm termbase. Because it was stored as a two-column spreadsheet the information could have been easily converted into a MultiTerm TermBase using the MultiTerm Converter Tool, but to simplify the process even more I opted to use the Open Exchange application Glossary Converter. 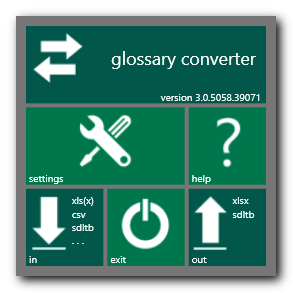 The Glossary Converter application automatically converts a terminology file (supporting xls, xlsx, csv, txt [tab-delimited], TBX, UTX and even TMX file types) into a MultiTerm TermBase, and vice versa, by simply dragging and dropping the file onto the application window. Interoperability has come a long way in recent years, but still has a way to go. The improved interoperability is a very important development because it removes or at least minimizes some of the artificial obstacles, barriers and limitations that users have faced and that, in part, contributed to the unhealthy focus on technology. Technology is just an enabler, not the destination. In this article I offered a short overview of TEnTs interoperability, as well as Studio-specific short case study that describes how a confusing and somewhat discouraging project that involved files that were created by different generations of another tool has turned into a straightforward Studio project. To end this article on a positive note, my colleague reported that everything went smoothly and flawlessly, and that the project was a complete success. What is your experience, good or bad, with TEnTs interoperability?